Many people exfoliate their skin, especially when it is dry, to remove the dead skin cells and make their skin look and feel better. They also exfoliate their face, which makes it healthier. But not too many people consider removing dead skin from the scalp. In this article, we will make some suggestions on how to exfoliate your dry scalp. If you go to a specialty store for beauty products, you’ll find hundreds of products that exfoliate your skin. There are salts, special baths, sponges, exfoliating brushes, etc. This is because the skin cells die, but don’t fall off nearly as easily. Your scalp is the same way. It is even more important to exfoliate your scalp, because not only does it have the same dead skin cells, but people also use hair products like hair spray, gel, and other styling products. Also, the artificial heat from hair dryers, curling irons, and straightening irons cause damage to the skin. What Are the Benefits of Exfoliating the Scalp? Can Exfoliation of the Scalp Stop Hair Loss? Is Exfoliation of the Scalp Worthwhile? When you exfoliate, you take all the layers of debris away and allow the natural oils, called sebum, to return. These oils are what keep your scalp healthy. When the oils do their job correctly, you won’t have a dry scalp. Of course, you can’t do this the same way as with your other skin, but you can use scrubs and massage them into your scalp with your fingers. You will immediately feel the difference. Especially in harsh weather conditions, such as extreme cold or heat, when your scalp is the driest, it is important to do what you can to keep it healthy. If you see flakes coming from it, they are probably not dandruff. They are the dead skin cells falling off. Dandruff causes huge white flakes while dry scalp causes small yellowish-white flakes. Here’s some advice on removing dry scalp flakes from the scalp. There are different things that you can use to exfoliate. They do sell exfoliating shampoos, but you can make one at home if funds are tight. All you need is hair conditioner, baking soda, sugar, and an essential oil, such as Australian tea tree oil. The essential oil is important because it’s a natural way to put nourishing vitamins back into your scalp, allowing it to heal faster. Essential oils are taken from the leaves of trees and plants and are kept 100% natural. They have powerful healing properties and have vitamins that your skin needs to be healthy. Tea tree oil has natural healing properties that are anti-inflammatory and anti-bacterial. The best tea tree oil available is Apothecary Tea Tree Oil. 1 Tablespoon of baking soda or brown sugar. 3 Tablespoons of hair conditioner. 3 Drops of an essential oil, preferably Tea tree oil. Thoroughly mix all of the ingredients together. Wet your hair as you would when you wash it. Using your fingers, scrub this mixture onto your scalp gently, massaging it on your skin. Keep it on the skin as much as possible, not the hair. It won’t damage your hair in anyway, it just doesn’t do anything for it and you don’t want to waste the mixture. Massage the mixture into your scalp, applying a little pressure. Not so hard as to hurt yourself, of course, but hard enough to get the dead cells off. Make sure that you get your total scalp, including your hairline. When you are done, rinse it out as well as you can, and shampoo your hair as you normally would. Don’t worry about your hair getting oily because essential oils go directly into your skin. By the time you are done washing your hair, the oil will be completely under your skin. There are different reasons for hair loss. Most times, though, it is because your scalp cannot produce the oils that your hair shafts need to grow and be healthy. An extremely dry scalp has been known to cause hair loss. No one can promise that anything will work to grow hair back, but exfoliation will make the scalp healthy again. Healthy hair starts with a healthy scalp. Massaging your scalp makes the blood flow better. Also, by clearing the dead skin and other debris from your scalp, your pores will open up again, and hair has a much better chance of growing. The sebum in your scalp will be able to get into the shafts of your hair, enabling to become stronger, making it thicker. 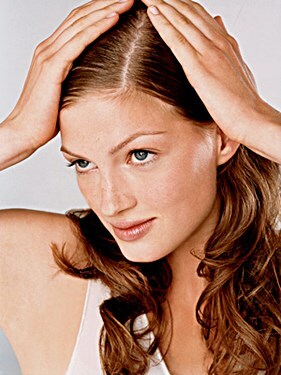 Dry scalp can not only be extremely irritating, and even hurt the more you scratch it, but it can also be embarrassing. You may be avoiding going out to public places because you are scratching your head so much. Some people suffer from a dry scalp so badly that they scratch it so much that it bleeds. This can easily lead to other problems, such as infection. Of course, it’s important to understand why your scalp is so dry. If it’s dehydration or the excessive use of hair care products, for example, you’re likely to benefit from the scalp exfoliation process. If you have an underlying medical condition, such as scalp psoriasis, you’re likely to need to use specialist shampoos to soothe the scalp and ease the discomfort that you’re experiencing. While it does take some time out of your day, a few days a week, to exfoliate, it can be worth the extra effort. From the first time that you do it, you will notice the itch fade. This is because it will take only one time to get most of the dead skin cells off, and this is what’s causing the itchiness. This isn’t something you should do all of the time. Maybe a few times a week, if you have a very dry scalp. But people usually do it about once or twice a month, to keep their scalp healthy. You don’t have to suffer from this anymore. By knowing how to exfoliate your dry scalp, you will be keeping it healthy, allowing the skin to breathe, and adding the vitamins from the essential oils, such as Apothecary Tea Tree Oil, will make it feel even better.